I’ve found a spa hotel worthy of a mention, completely competent, with a team totally admirable in the face of disaster…. 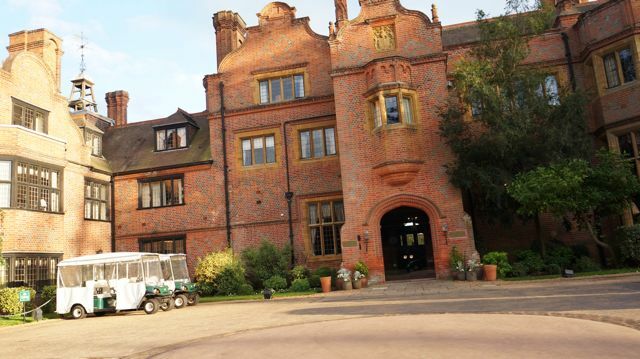 Hanbury Manor, a Marriott Hotel & Country Club, is an historic 17th century Jacobean style country house with 161 spacious bedrooms, set in 200 acres of stunning parkland just outside of Ware in Hertfordshire. 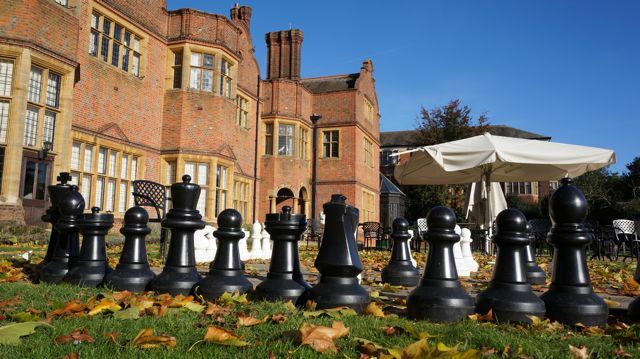 This beautiful manor house is in fact a Marriott Hotel and country club, still making use of the original features of this extensive property such as the chapel and original school which are both now used for events and banqueting areas around the courtyard. It’s the perfect venue for a wow-factor wedding or a stylish conference, the original feature rooms have high-ceilings and are filled with natural light overlooking the magnificent grounds and lake. The Spa at Hanbury Manor is open to non members, Monday to Friday and boasts a large Romanesque pool, alongside a jacuzzi, sauna and steam room to help you unwind and release some stress in one of their seven treatment rooms – with a full body massage through to a Jessica manicure and hand massage, you are truly spoilt for choice. 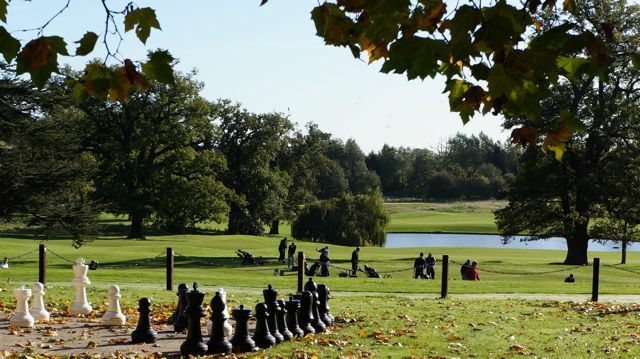 It’s also home to one of the best known golf courses in the country, with every hole being different and more challenging than the next, it covers an extensive 7,052 yards as a whole and as you drive up the long driveway to the hotel you get to see peeps of the course as you creep through. You can even train and learn how to be a pro-golfer, should you wish to up your game whilst staying. With half term here, I had a much needed week off and to kick plans off, a visit to Hanbury Manor was planned complete with afternoon tea and a few spa treatments thrown in for good measure. One tiny little problem the biggest storm (apparently) since 1987 had hit us and although I trooped on through those (gusts?!) of wind to get there, the power was out on arrival. Bother, blast and just my luck! A group of us were led to the darkness of the Oak Hall (with a stunning and regal fireplace that made me want to light it & curl up there and then) and were advised that the treatment rooms were too dark to see (even the toilets were pitch black and needed phone light to lead the way on using!) and the kitchens weren’t running, even the pool was out of action. Basically, no spa day today ladies & gents…. But, instead of being turned away, the complete opposite was in fact offered. The welcoming and extremely apologetic team showed me to the spa, albeit through very dark corridors and into the very sorry looking spa set in the darkness of this particular morning and I was greeted with a smile or two from the team as I would expect in any situation. No matter how odd this particular situation was, I was offered a manicure by torchlight and opted for some very glitzy gold nails to help boost my Monday morning mood. It worked, the therapist was lovely, chatty, but not overly inquisitive as we swapped notes on favourite afternoon teas and she did a fantastic job on my newly grown nails, even complimenting me on how healthy they looked, which was great to know as a nail biter by trade. I was advised a good couple of hours until my preened and glittering nails would be ready for action, so I took advantage of a jug of refreshing iced lemon water and a catch up on my workload before heading home. I hovered in the hope that the power may return, but it didn’t, so it was agreed to come back later in the week for a more successful visit. I truly couldn’t fault the service within a very stressful and unexpected position and however disappointing the lack of spa access was, they could have just turned us all away and offered nothing, I was highly impressed. It was a much sunnier day on my return a few days later and the electricity, thankfully, was back and here to stay. 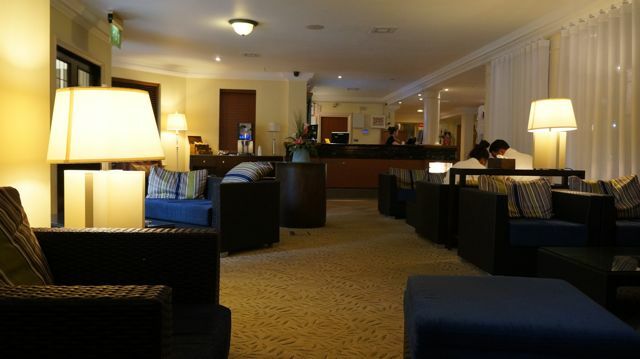 I wandered through the long corridors and noticed just how beautiful the courtyard was as I went, something I hadn’t noticed the first time, as well as the hair salon and shops as I went too, this hotel is huge and very well equipped, something I hadn’t appreciated in the dark. My first stop was a cold shower to perk me up (seeing as I had avoided caffeine on this particular day, simply unheard of under usual circumstances), followed by the suggested two bursts of 12 minutes in their large steam room, just around the corner from the grand oak-lockered changing rooms. It had small twinkly lights in, but offered such a thick, scented fog that you could hardly see one foot in front of the other… To start with I didn’t like this, but as people came in, I liked that I could hide and not see anyone else’s face at the same time. In fact, I had a lovely light hearted conversation with a lady in here, but who she was out in the pool later on was anybody’s guess, rather amusing. The pool house itself was designed to look like Roman baths, with pillars, tiling and ornate artwork on the walls, it had the sound of running water, and actually made me feel sleepy whilst sat on the poolside with a cup of tea in the “quiet area” a bit later. The reception team advised me to arrive ten minutes prior to my treatment, of which I had a 25 minute “Decleor Express Facial” booked and I’m so glad I did, it was heaven. The girl got me cosy and wrapped up in a warm furry blanket before getting to work scrubbing, rubbing and preening my face, even tussling my hair and giving me a head massage as she went (I’m a sucker for a good hair tussle I must say). The only downside of this massage was that I looked like the joker (from Batman) afterwards, my hair up in a scary clown style – I was basically ready to go trick or treating! 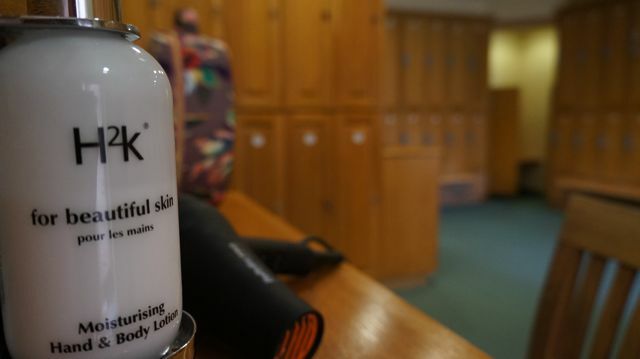 Once I’d made use of the spa facilities, I got myself in a hot shower and treated myself to all the fabulous lotions and potions on offer and I was impressed with the size of the large fluffy towel provided in my locker alongside my robe. I’m a curvy girl, so I like a towel that I can wrap around and not have to grip onto in fear of it unravelling, his would wrap around me twice, it was HUGE – perfect! The hair dryer on offer in a spa always worries me, as 9 times out of 10 they just whistle out a pathetic wind and it takes ages to blow dry your “do”, but not these bad boys, they were powerful and did the job in a matter of minutes, an added bonus! I was booked, as mentioned on the spa package, to enjoy my afternoon tea in the beautiful baronial Oak Hall, however this was not quite the case and I was seated in the equally charismatic library adjacent to the hall. I was mildly disappointed with this, as had been looking forward to be sitting by the fireplace in this stunning oak room, although it wasn’t lit yet, so not all was lost. The library has a stunning view of the golf course and hotel grounds, however the only downside was that it was very quiet, so I could hear the couple next to me chomping on their sandwiched scones (oh, how I had to bite my tongue!) 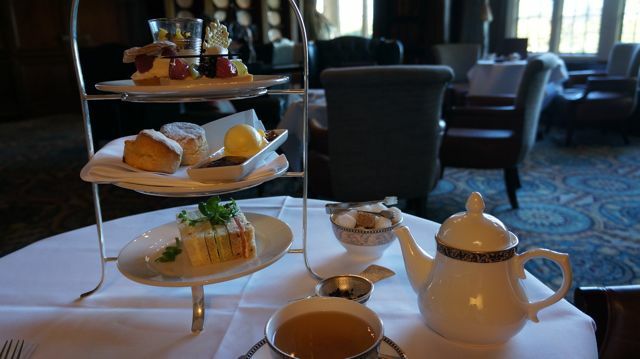 and listen to the lady at the table moan about the calories in her cakes… it’s afternoon tea my dear, for goodness sake. A little background music would have done the trick and allowed for a less self-conscious seating, but then I was on my own for this and it’s never easy to look like a “billy no mates” whilst dining alone for the most part. I was told that a pianist plays at the weekends, so this would be something to look forward to if booking on a Saturday or Sunday. My delicious afternoon tea came out to me on a tall silver stand and the fluffy fruit scones were wrapped in a cloth napkin to keep them warm which was a nice touch, with lashings of strawberry jam and clotted cream to keep a girl happy. 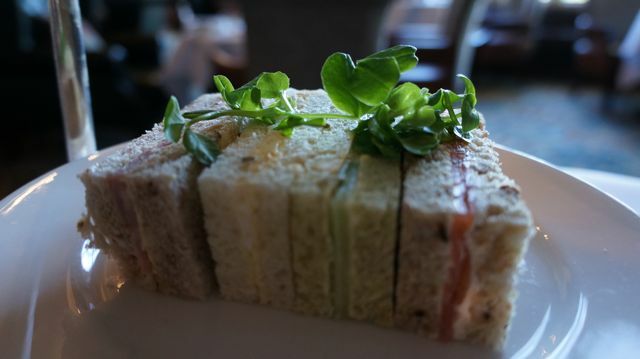 My finger sandwiches were delicious, with four fillings to enjoy including ham and cheese on a crunchy multiseed bread, smoked salmon and cream cheese on granary bread, cucumber on dill bread (it was almost green in colour, very unusual) and egg mayonaise. I’d say the only let downs on these were that they were very cold, most obviously pre-made and chilled, but they were fresh, so I’m just being picky. I would have liked one or two more fingers, but I wasn’t clear on the rules of refreshing these beauties until I was well into my cake tier and it was a service offered too late – anybody going here for afternoon tea in the future, remember this if you fancy more sarnies. There was a large selection of coffees and loose leaf teas and I opted for the “Rose Congou Superior” tea which wasn’t overbearing and worked perfectly with my pastries. It was refreshed half way through as well which was a nice offer to take up from my ever so friendly waitress. The stunning cakes and pastries were the best part of this affair if I had to choose…there was a small shot of lemon cheesecake topped with fresh orange segments & dark chocolate shavings with a sprinkle of thyme leaves, which seems to be the new craze – but it worked, I really enjoyed this as it’s not something I’ve sampled before personally. I also tucked into a miniature fruit tart with edible gold leaf which was almost a shortbread trough filled with crème patisserie with glazed fruit, it looked like a beautiful tiny fruit basket – My favourite of the sweet treats I must say. To add to these, I also nibbled through a fresh raspberry & vanilla cream filled choux crown (of which was still crisp to the bite when I got to it) and a small mocha opera cake with a stunning white chocolate snowflake adorning it – this offered a real coffee hit. Each afternoon tea treat was genuinely as delicious as the last! There were small water stations dotted around the spa with chilled water, fresh lemon slices and even various cordials to keep you refreshed. It makes keeping rehydrated a little more fun than simply a water fountain to drink from – I really liked this little touch. My beauty therapist gave me a choice of chilled drink before I left the room, allowing time to wake up and feel ready to wander around, even giving me some skin advice and some cute little samples to take away, what fantastic and unexpected service, she was brilliant and wasn’t pushy in any way. There’s a gym here. 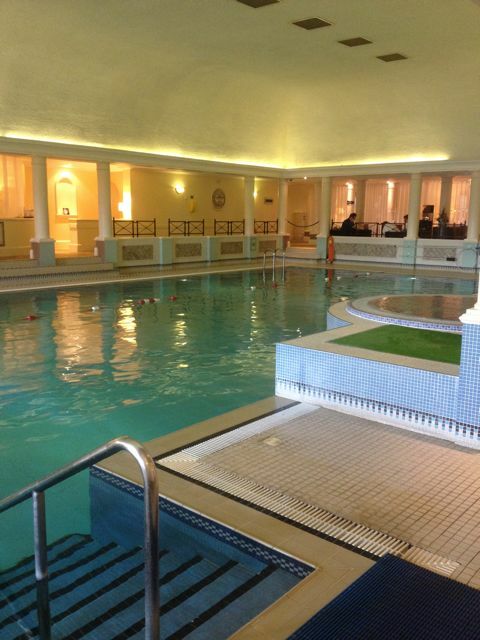 I had completely missed that on the website, which is a shame, as I probably would have used it, so if you plan to visit bring your trackie suit and sweat it out in this well kitted out studio before you take a well deserved dip in the pool – perfect if planning afternoon tea afterwards! If I had to pick fault, I’d say being unfamiliar with the layout, I found the steam room to be very dark and it was hard to adjust to the mist as well as find a seat. It also didn’t have a clock in view, so it was very tricky to know how long I had been in there, I had to guess when my 12 minutes were up. It was half term. I didn’t consider this. This is a child friendly venue. I am a child friendly woman, but not when it comes to my relaxing spa. I don’t like being splashed in the eyes or sharing my jacuzzi with a young boy who’s debating if he should dive bomb into the pool. Personally, it just took me a little longer than anticipated to chill out as a result. Once you shower or use the steam room, you have to walk along a slippery floor and down some steps with no real grip on them to get to the pool. It took me ages to walk anywhere due to a fear of slipping over, of which I saw a couple of people nearly go themselves. It could do with some sort of grip to the floor to make it feel a little safer around the pool areas. I would say that this is more of a business stop over or to use for a “health club experience” before sampling their stunning food. If you are looking for a full on (and peaceful) spa day, make sure you go on a week day whilst the kids are still at school. For £65.00 per person and available Monday to Thursday only – pre booking is required. If you are lucky enough to be staying at Hanbury Manor for the night, you can dine in the charming and formal Zodiac Restaurant of which has own two AA rosettes and boasts a drool-inducing menu with locally sourced ingredients – I must personally return to sample their food, it’d be rude not to. I got to have a sneaky peek into the dining room and the tables looked stunning, no dessert cutlery in sight (which is correct for a British place setting)… a little dining etiquette geekery for you. You can view my full photo album for this stay by clicking here. You can also read about Miss Sue Flay’s other Secret Stays & Reviews here.